Cozumel's northern lagoons are teeming with fish year-round. Bonefish, permit, tarpon, snook, triggerfish, small snapper, and even barracuda are the primary targets on these trips. 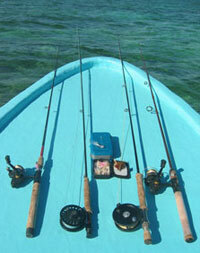 Much of the flats fishing in Cozumel is done while wading, as the lagoons are very shallow. Spinning & light tackle is available too. Take a 15-25 minute boat ride in a Mexican panga boat to one of the three secluded lagoons and flats on the North end of Cozumel where bonefish await! Choose from fly fishing or spinning light tackle, or try a little bit of everything! Learn the secrets of Cozumel flats fishing as your expert guide teaches you about Cozumel's unique weather and wind conditions. Never fly fished before? Your guide will be happy to teach you. Where: Marina Puerto Abrigo, about 1.5 miles North of town. How Long: 6 or 8 hours - Your Choice. Trip Prices are Per Boat, not Per Person. Max. 2 People per Boat. We offer discounts for multiple days! Call Us! Taxis are lined up waiting for you as you get off the ship. Very easy. Should cost only about $3.00 USD from Punta Langosta or $8.00 from the Intl and Puerta Maya piers.